ELLEN EMMA Loved sister of Elsie, Aunt to Mark, Stephanie, Daniel, Megan and families. Our love to her family. 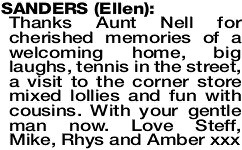 The Celebration of the Life of the Late Mrs Ellen Sanders of Bunbury will take place at the Bunbury Crematorium Chapel, Hales Street, BUNBURY on THURSDAY (4.4.2019) commencing at 10am.